Please invest in our youth by donating generously to our program. Afro Brazil Arts welcomes your support to fund performances for under-served teens in NYC high schools, scholarships for classes at our CAQ New York Mindful Capoeira Center and leadership training and development for program participants. One graduate of our program, Omitola Hill, began studying Capoeria at age 4 and is now a contra-mestre (soon to be a Mestre.) He supervises his own academy and is invited to teach and perform all over the world. As a much beloved Capoeira icon, he is a shining example of a Mindful Capoeira education. Providing capoeira scholarships to teens with training and development in leadership, employment and life skills. Teen Leadership Program offers scholarships to teens in NYC high schools to enroll in capoeira classes at our New York Mindful Capoeira Center. Participants will be trained and developed in capoeira and in leadership, life and employment skills. One summer I took my son, Omitola, to see a movie called “Only the Strong”, about capoeira, and we really enjoyed the movements, music and culture. Omi sat still, focusing and enjoying the film. After the movie, he said, “I want to do that.” That was the start of his capoeira journey. 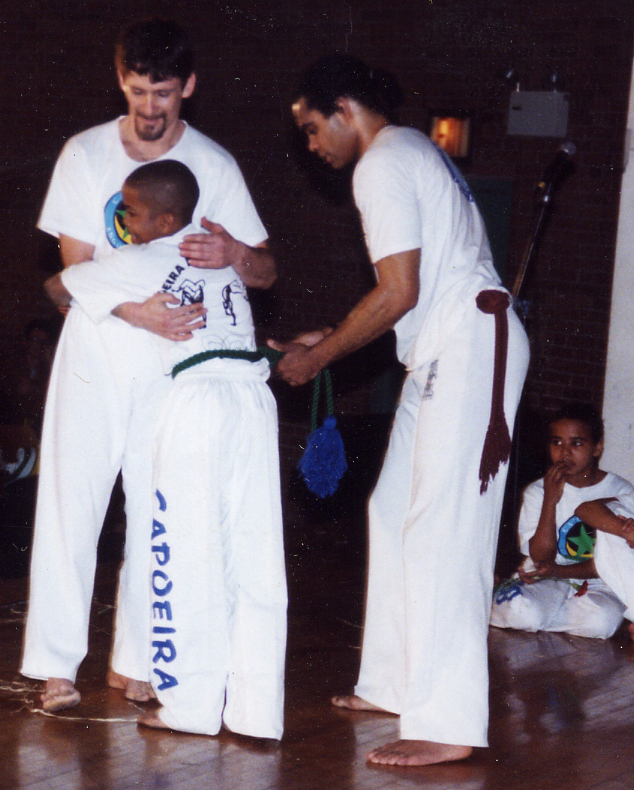 Searching for capoeira classes for my son Omi, I spoke with Michael Goldstein, who had been recommended by the Capoeeira Foundation, and I enrolled Omi in his class. I have never seen a person with so much patience and love for children as Ombrinho, I was very happy, and all Omi could talk about was his capoeira teacher. When he came home from school he would practice until time for bed. It was like an empty space was filled in his life. This was important, because Omi’s father is out of his life, his two favorite uncles died, and a male role model was missing: Ombrinho filled that gap. When Mestre No and several other capoeiristas came from Brazil they came straight to our home to meet Omi, the little boy Ombrinho always talked about. I did not understand a word they said, but I could feel their love for capoeira and children. Ombrinho had gotten them to bring Omi’s first berimbau. This was the year he received his first capoeira cord; he slept with it for a month. Mestre Lincoln, who was one of the capoeiristas in the group later started teaching at Omi’s school. He spoke limited English, but he and Omi would travel after school to Ombrinho’s class in Manhattan. We are still very close to these individuals thirteen years later. On Omi’s seventh birthday the entire Afro-Brazil Arts troupe surprised him and came to his school and performed for the whole school and during the performance they called him to the stage. Omi was king of the school for a day. On this birthday one of Mestre Ombrinho’s students who is a doctor took Omi for his first plane ride around Manhattan. Ombrinho accompanied Omi and they had a wonderful time. Now he is a freshman at Borough of Manhattan Community college, majoring in Architecture. He has started a capoeira club at the college and is also teaching capoeira at the New School University. To a single mother raising an Afro-American child it is so important that he has been surrounded by a village, and our village has been capoeira. It has been a blessing because it exposed Omi to different people from a variety of cultures. As a male, he learned that you can be strong in will but gentle in heart. All of the love and support my son has received could never be replaced, and what is beautiful is that the only thing that has ever been asked in return is to respect one’s self, others, and capoeira. As a mother I am proud of my son and the type of young man he has become, and I owe it to the whole village of people involved in his life. I thank God and all the spiritual forces every day for the capoeira village and especially Mestre Ombrinho. There will always be a special place in my heart for the love that Mestre Ombrinho has given to my son. May blessings and peace always be with this village.